EdGate’s patented correlation methodology offers a “once and done” correlation system that does not require re-alignment of content when new standards are implemented. In the world of Education, alignment to educational standards is the name of the game. A new API, released by EdGate Correlation Services, offers a true Platform as a Service (PaaS), providing access to the most robust and up-to-date educational standards repository in existence. Publishers now have entrée to a data interface that provides a real-time method to integrate standards and correlations, while also giving publishers the opportunity to develop their own tools specific to their product. Customers have the opportunity to use the same methods that the EdGate Correlation Services team uses for their 250+ publishing clients, without the challenge of having to manage the data internally. “EdGate understands that some publishers prefer to maintain some level of control over the correlation process. The heavy lifting can now be shared. Publishers can rely on EdGate to keep the standards up to date and provide easy-to-use API functionality and a modern response format so that they are able to focus on creating market-leading education products rather than trying to build infrastructures that are costly to develop and support,” said Gina Faulk, EdGate’s General Manager. 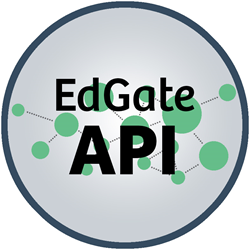 The new API offers flexibility that allows publishers to utilize their systems for organizing and managing content and standards while simultaneously creating alignments via EdGate’s extensive repository of K-12 educational U.S. and International standards. Moreover, EdGate’s patented correlation methodology based on EdGate’s Controlled Vocabulary offers the client a “once and done” correlation system that does not require re-alignment of content when new standards are implemented. Additionally, the API provides users with the ability to generate reports to help identify and fill in any gaps in their standards. API users can depend on EdGate’s twenty years of subject matter expertise along with the extensive care that has been taken to validate the core concepts covered by over five million educational standards. Founded in 1997, EdGate Correlation Services is committed to delivering the highest level of service and data products to educational publishers. EdGate's Standards Repository team tracks standards for all 50 states, Common Core State Standards plus international and custom sets of standards. EdGate’s subject area experts align material from more than 250 publishers and content providers. Curriculum Matrix and CMX, powered by EdGate, provide personalized learning for every K-12 student using expertly curated and vetted Open Educational Resources. For more information, please visit http://correlation.edgate.com. EdGate Correlation Services is a division of San-Diego based EDmin, Inc. EDmin’s flagship product, INFORM Journeys, is dedicated to helping every student have access to an interactive learning map with detailed directions to life’s possibilities. Journeys will provide learners of all ages a “voice and a choice” on their path to reach their academic and career goals. For more information, please visit http://www.informjourneys.com or follow @informjourneys on Facebook, Instagram, Twitter and YouTube.